The Madera Ballroom was filled on Monday night for the scholarship award presentations of the local high school and women-in-transition scholarship winners. Awardees were joined by family, friends and TWOQC members for the presentation. 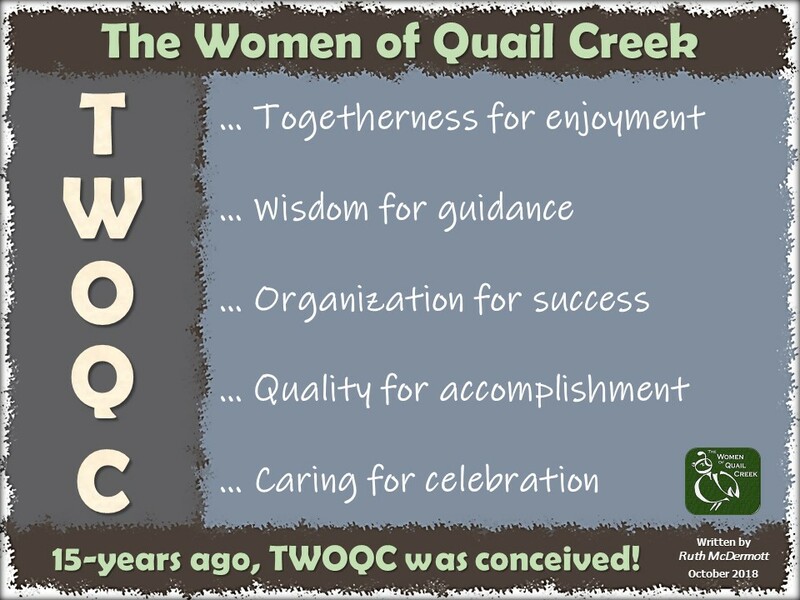 The ladies demonstrated grace and poise as they thanked TWOQC for their award. They shared their aspirations and plans for their future, acknowledging what this support means to them. They also talked about the importance of service and their ongoing commitment to their community. Thank you to the Scholarship Committee and all others who contributed to the success of Monday’s program, and to the countless individuals in our community for their support and contributions. If you were not able to attend the program on Monday night, the Scholarship presentation slideshow is available online. Watch for TWOQC club photographer’s (Eileen Sykora) photos via a link in the Photo Gallery in a couple of weeks. The Honor Flight letters (397!) have been sent to the distributor for the mail bags for each veteran. Thank you to those who wrote an extra letter. One veteran dropped out of this Honor Flight and was replaced by another so the extra letter helps greatly when these last-minute changes occur. Send-off: Saturday, May 12th at 4:00 a.m. Welcome home: Monday, May 14th at about 8:00 p.m. It is always encouraged to check the So. Arizona Honor Flight website for last minute updates and flight details. Thank you to all who continue to honor our Veterans. A special thank you to the Ladies Putters for their baby shower contributions and monetary donations that were presented at Monday’s scholarship program. With two weeks to go, the donation boxes will be in the Madera Clubhouse lobby and at the Krieg residence (2680 E. Sawyer Road). Baby outfits and onesies (3 mos to 12 mos sizes) are still high on the list of needs. Not sure what to donate but want to help? Checks (made payable to TWOQC-Charity Account, “Baby Shower” on memo line) can be left at the QC Concierge Desk during business hours or at the Krieg residence. Due to the Memorial Day holiday, May’s program, “The Good, the Bad, & the Ugly of Designing Cacti Containers”, will be one week early. Be sure to mark your calendars for Monday, May 21st (6:30 p.m). Thanks to all who brought donations for the Green Valley-Amado Food Bank to the program on April 30. The Food Bank reported that our groceries totaled 43 lbs. plus a $25 monetary donation. As the emphasis on Monday evening was the scholarship recipients, we would like to try again to support the Food Bank at our May 21 program. Please consider bringing donations of non-perishable groceries, cleaning, paper and hygiene supplies to the program and place them in the bins which will be outside the Ballroom door. As always thank you so much for your support for the food bank. The VA clothing closet for homeless veterans is completely out of underwear and shoes for both men and women. Their supply of summer weight socks is low. Underwear and socks must be new but shoes can be gently worn. They are also looking for “summer weight” career-type clothing for unemployed veterans, both men and women. Women’s purses are also needed. Due to storage space limitations, please save your heavier weight clothing for the annual clothing drive scheduled for October 20. Donations can be brought to the program on May 21 and/or also be dropped off at the McGee’s house, 1908 E Longspur Place, at any time. “Thank you” to this week’s FMM contributors: Peggy McGee, Carol Mutter, and Kay Robinson; and to the support team: JoAnn Haberer and Marianne Cobarrubias.